If you’re used to travelling light, and you’re going on your first holiday with baby this summer, you could be in for a shock. Travelling with hand luggage only might no longer be a brilliant idea, and you might even need to turn up at the airport earlier than usual to ensure you have enough time to make all the extra stops, such as queuing at the oversized luggage counter to drop off your buggy, or searching the departure lounge for somewhere to buy a baby sunhat or some formula or anything else you’ve left behind. 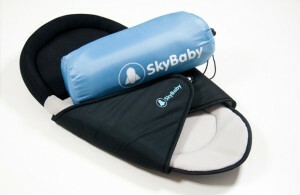 If you’re flying with baby, the mini travel mattress SkyBaby is ideal. I liked the product so much when we were using it, as I felt it made it easier to travel with baby, so I’ve since secured distribution rights for SkyBaby in other countries. The mattress, which creates a comfortable sleeping space for baby when flying, is lightweight and compact, and it rolls up into a sleeve with a clip that can easily be attached to a changing bag to save luggage space. If you want to avoid travelling with a heavy buggy, you can buy a lightweight Maclaren buggy suitable from birth to use for airtravel. We were recommended Maclaren Quest, a model where baby can lie flat, and we started using this from when baby was a couple of months old. This was ideal for us to use to the gate at the airport, but the alternative would have been to have baby in a baby carrier and check in the buggy we were using day-to-day. Although most hotels offer cot beds for babies, we still like travelling with our own travel cot and roll-up mattress, as baby has become used to that cot and sleeps well in it. We like the BabyDan travel cot, as it seems robust and it’s compact and easy to assemble. It would have been nice if it had been even more lightweight, but if this had made it feel less sturdy, I don’t think it would have lasted as long. It’s also been useful to have a travel cot when staying in small hotels with friends, as we’ve experienced that a hotel only has one travel cot available, for example. 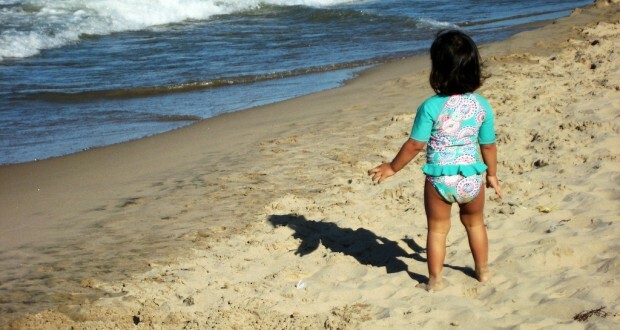 Some of the smaller items we also like to pack for a summer holiday with baby in tow include: swim nappies, disposable bibs if baby is on solids, travel steriliser, washing up brush for baby bottles, and sunshade for the buggy. Bloom and Beyond- New Mum, New You!